From Goodreads ~ Twenty-four-year-old Kylie Reed has always been a rule follower. Organized and cautious to a fault, her dreams for life are often filed away for future use - when she has a house, when she meets her future husband, when she has been at her visual display job at a chic Dallas boutique longer ... Kylie always has a reason for living her life in the future, not in the present, and not living her life to the fullest and reaching her dream of becoming a fashion designer. The only exception to rules, of course, would be running away with Prince Harry - Kylie’s ideal man. A hot, fun ginger boy would be worth breaking all the rules for, of course. And Kylie is sure Harry just needs the right, centering woman to settle him down. But living in Dallas and not knowing Prince Harry make this a non-option. Because when Kylie accidentally falls into the lap of a gorgeous ginger boy - yes, even more gorgeous than the real Prince Harry - all bets are off. Could this stranger be the one to show Kylie how to take a chance, to face her fears, and live in the present? And could this stranger be the Prince Harry she has been waiting for? Kylie’s life takes some unexpected twists and turns thanks to this chance encounter, and she knows her life will never be the same because of it. Kylie wasn't having a good time at her brother's wedding so she escapes to the hotel bar to have a drink and some time to herself. 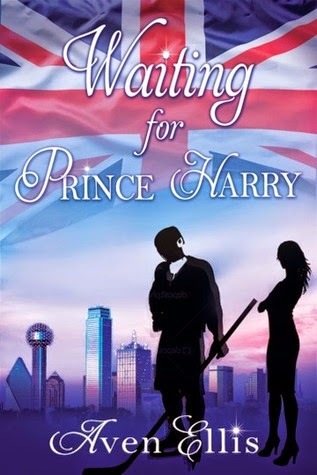 She has a crush on Prince Harry and in the bar falls into the lap of a man who she finds even hotter than Harry. Without introducing themselves, they connect and talk for hours and she's devastated to realize she'll never see him again. But Harrison tracks her down. Yay! It turns out he is the captain of the local professional hockey team and they become friends and then quickly more. Kylie's quiet life in a boutique doing visual displays is radically different than Harrison's ... he is recognized wherever he goes and has women constantly throwing themselves at him. This is the first book I've read by this author and I liked it. I rarely read pure romance books so this was a nice change. I liked the writing style and thought it flowed well. There was tension but also resolution and things move along rather quickly. It was humorous (I thought the pool table scene was cute). It is written in first person perspective from Kylie's point of view. As a head's up, there is a fair amount of swearing (F-bombs, etc.). I like the main characters, Kylie and Harrison and thought they were good together ... their interactions showed that they were on the same page most of the time and cared about each other. They have a couple blow-ups where their age and immaturity to handle some situations comes through but they then have the maturity to realize how to fix it and do. There is a happy ending (yay!) and each gains the strength from the other to stand up and be who they really want to be. If you are looking for a cute romance, you should check it out. Eh, romance novels aren't my thing.